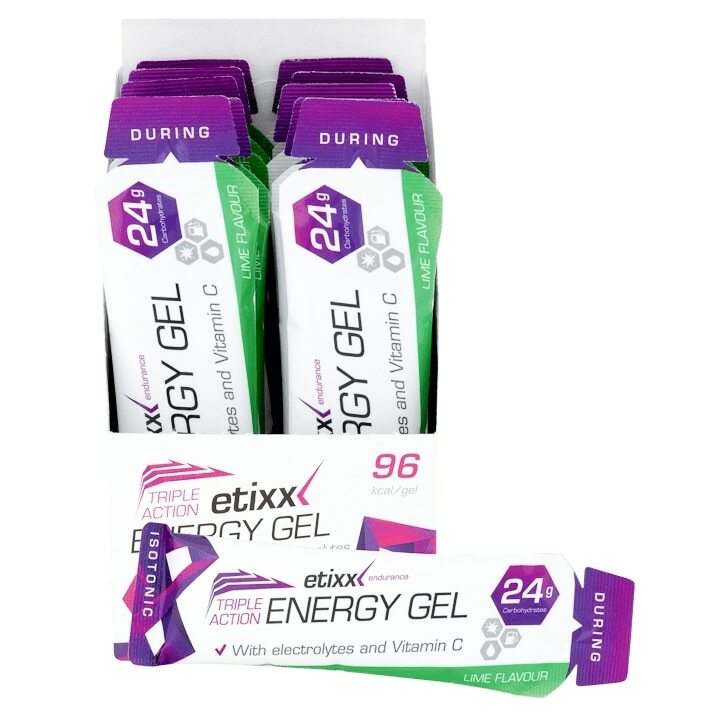 This gel contains the ‘triple action effect’ sugar syrup and a mix of citrates. This unique sugar mixture comprises the ideal combination of monosaccharide’s, disaccharides and higher (poly) saccharides. Because these chains differ in length, they are gradually being absorbed into the body. 1 to 2 gels per hour of exercise as required. Isotonic beverage when consumed together with 350 ml water. It is recommended to drink a sufficient amount of water (at least 350ml to 700ml per hour) whilst practising sports in order to avoid dehydration. Sugar syrup 32g (Dextrose 8% / Sucrose 55% / Maltose 6% / Higher sugars 31%) , Potassium citrate , Sodium citrate , Flavour: Malic acid , Calcium citrate , Magnesium citrate , Preservative: Potassium sorbate , Flavour: Lime , Ascorbic acid , Manganese citrate , Iron citrate , Water.